The designer behind the Bari J. brand is Bari J. Ackerman. The brand debuted in 2004 featuring handbags and accessories. In 2009 Bari changed the focus of the business to fabric and surface design and sewing patterns. Her first book, Inspired to Sew, shipped to stores in January 2011. Today, along with limited edition handbags and accessories she brings you her line of "Keeping it Real" sewing patterns. Her fabric and sewing patterns are available in stores throughout the world. 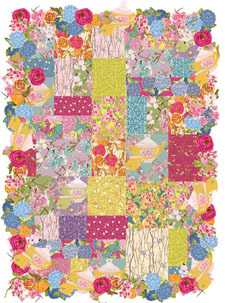 As refreshing as the breath of Spring, this quilt pattern by Bari J. will be both interesting and fun to quilt! Accented with a collaged motif border, this will be a delightful project. See more of Bari J. 's designs at her blog: Bari J.